I was catching up on blogs yesterday and I saw Love Maegan carrying a GORGEOUS burgundy Cynthia Rowley Satchel. I was only able to find a black version online but I definitely like the burgundy better. 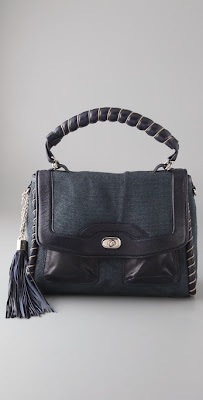 I love the top handle and the tassel on the side and the long strap gives you two ways to wear it. The price isn't totally ridiculous d but this version is mostly canvas so I can only imagine what a full leather version would be. Too bad I can't afford it. 240 for the bag is pretty decent.. i love the tassels and embroidery around the edges! I love the tassel on the side - I like that it's just a little touch of fringe, very cute! the stitching on the handle and sides makes it so adorable! i imagine how cute it must be in burgundy! What a gorgeous bag-the shape is so chic! I would so totally use this every day of my life. It's perfect. Oh I really do want one!! Very cute! I've seen this as well while browsing shopbop. The handle might be a bit large for my tastes, but I'd have to see someone wearing it I guess. this may be a little late, but shopbop appears to have the burgandy leather as well, for $290. They just don't have it labeled as the Constance. From what i can tell, it's the same one, just called the "Cynthia Rowley Wrapped Piping Satchel"